Note: Workspace Templates are only available for Enterprise and Agency plans. A Workspace Template is a workspace that has been pre-configured and can then be cloned (copied) as needed. They are an excellent way to ensure structural consistency across multiple workspaces and are ideal for companies that often create new workspaces for specific projects or clients. As a result, client or project workspaces can be structured identically with virtually no setup required. Navigate to the Workspace you would like to create as a template, and select the Settings tab > General Settings. Under Options find the option for "Make this workspace available as a Template in the Workspace Creation Wizard" and select Yes. Workspace Templates will appear as a Workspace Type option when a new workspace is created. Note: Workspace templates are not accessible from your Workspaces menu and can only be accessed by Company Administrators via the Company Setup area. Templates are intended to be used for cloning purposes only. 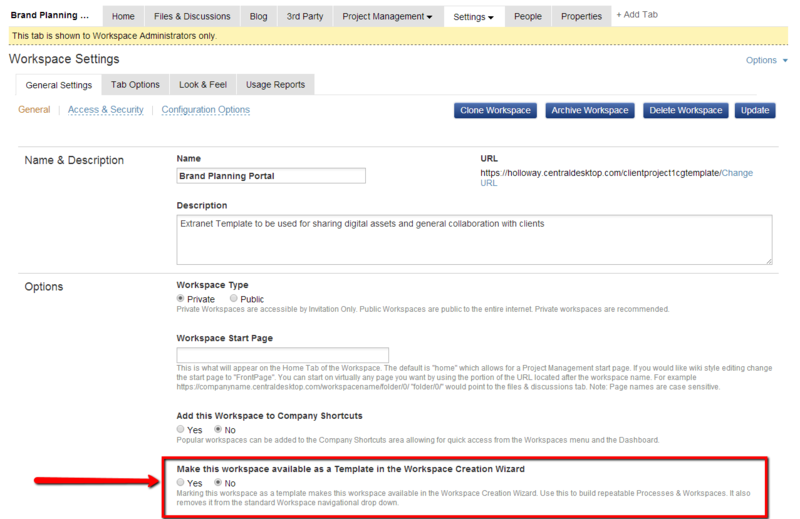 Using the template manager located within the Company Setup, it is possible to arrange how the templates will appear in the Workspace Creation Wizard. Administrators can reserve templates that are not in use as well as arrange those actively uses to personalized specifications. To manage your templates, first select the company admin menu (gear icon in the top right). From here, select Company Setup > Templates > Workspace Templates. To adjust which templates are available in new workspace creation and the order in which they appear, select "Creation Wizard Layout". Reserved templates are stored on the left-hand side while active templates are arranged on the right-hand side. Templates can be moved using drag and drop. Once adjustments have been made in the Template manager, be sure to click Update to save the changes. To view and access current templates, select "View Templates"
Administrators can select the icon that appears for a Workspace Template in the Workspace Settings. To personalize the template icon, navigate to the template workspace, select Settings > General Settings, locate the option to "Select the Icon you want to use in the Workspace Creation Wizard," choose an icon, and click Update.